Renowned behavioral scientist and bestselling author, Brian Wansink, joined us at REACH 2012 to explain a common myth about obesity: buffets make us fat. If buffets really make us fat, then why are there plenty of skinny people at a buffet? Wansink and his team sought to uncover what skinny people do differently than heavy people when facing a plethora of food. By identifying and replicating the behaviors of the successfully thin, we can combat our tendency to overeat. So, how can we put this research into practice? 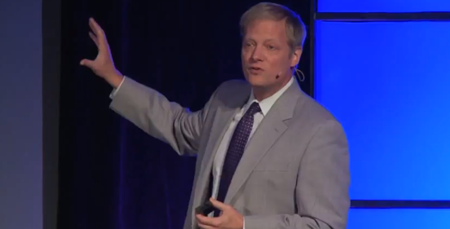 In his twenty-minute BIG Idea speech, Wansink says it’s easier to change your environment than your mind. Instead of assuming you’ll have enough willpower to simply eat less when in an environment where gluttony is the goal, do as the skinny did and get rid of the things that will derail your diet. The secret to mindless eating is not mindful eating. The solution is to change your environment so it works for you instead of against you. Visit the VitalSmarts Video Channel and select Brian’s Mindless Eating Meets Influencer BIG Idea speech to learn how to cut calories.